As our clients know, we have been forecasting a very hard recession over the next few years. At the beginning of this year, our analysis was viewed with skepticism, but as more data comes in from the recent performance of the economy, our forecast is becoming more probable. One of our main arguments has been that U.S. consumers are holding unsustainable levels of debt. The chart below from Ian Gordon, from The Long Wave Analyst shows private debt levels to GDP overlaid with his interpretation of the Kondratieff Wave. Without giving a lengthy description of the Kondratieff Wave, let us just say that as interest rates fall, investors are willing to take on more debt. Much of this credit is spent or used to fuel asset bubbles. Eventually bubbles exhaust themselves and deflate assets but debt is still owed. Participants must default on their debts causing loss of faith in financial institutions and subsequent depression. As you can see debt is now 300% of GNP, much higher than in 1929. Where Is the Debt Coming From? In the chart below from Yardeni.com, U.S. consumers have been withdrawing money from their houses at record levels. Simultaneously, they have been saving less. 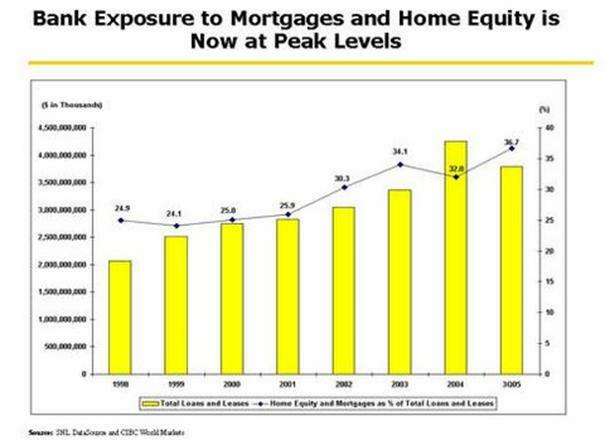 The reliance on home equity extraction (increasing mortgage debt) to fuel the economy is similar to stock market investors in the 20’s, who were borrowing money to invest in the stock market. As history has shown, once the speculation exhausts itself assets deflate, but the debt still has to be paid back. Unfortunately, the housing bubble has already started its descent. Looking at the U.S. Housing Price Index chart below, from Robert Schiller author of Irrational Exuberance, the forecast that housing prices could not continue its trajectory was not very difficult. This rise has been driven by speculation. So far we have seen the ascent. And now we are beginning to see the descent: On October 27th, “the government reported median new home sale prices dropped 9.7% in the past year to $217,100, the lowest price in two years.” It's the largest percentage decline in 36 years according to MarketWatch. “Median prices for existing single-family homes are down 2.5% in the past year, the largest decline ever recorded.” We believe housing prices have peaked and U.S. consumers will not have any new “paper capital gains” from home equity loans to spend. Thus our consumer driven economy is in trouble. U.S. Consumers with “no money down” loans or little equity in their houses have already started to walk away from their debts. In the third quarter of this year, foreclosures are up 43% from 2005 (albeit from low levels). In Colorado (the nation’s leader), 1 in 127 households filed for foreclosure according to RealtyTrac. Nevada and Florida were closely behind with one new foreclosure for every 156 and 182 households, respectively. If U.S. consumers are getting financially squeezed, the first major purchase that they could try to delay would be buying a new car. 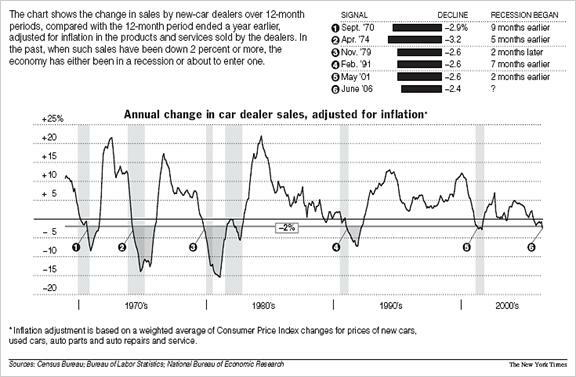 Below is a chart from The New York Times that shows the annual change in car dealer sales. When new car sales fall “by 2% or more, the economy has either been in a recession or about to enter one.” We have now fallen 2.4%. GDP has also started to reflect the slowdown. The GDP advance estimate for the third quarter reported on Oct 27, 2006 by the U.S. Department of Commerce was a paltry 1.6%. Shortly following the data release, Bloomberg reported that that the Department of Commerce found a “statistical fluke” and had reported a 26% increase in auto production. Subsequently, the numbers will be revised downward to a GDP advance estimate of 0.9% for the third quarter. So this year, the GDP has gone from 5.6% to 2.6% to 0.9% in the first three quarters. While U.S. consumers accumulated debt to keep the economy running, financial institutions gained more ownership of real estate (see above). The trouble is that real estate is extremely illiquid and when people get nervous they want cash. Unfortunately, banks are the most unprepared for this in the last 20 years. 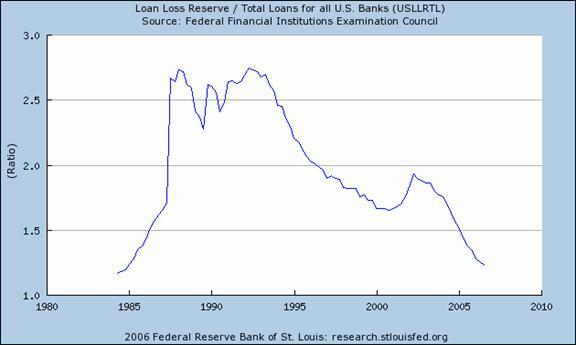 As you can see from the Federal Reserve Bank’s chart below, U.S. banks are letting loan loss reserves dwindle (their ‘rainy day’ fund if you like), which support them when foreclosures increase. We believe “severe macroeconomic repercussions” are highly likely and that “banking system capital” will be impaired. Continuing from our previous article “Credit Extreme Emotion,” the comparison to the 1930-1933 period is striking. Stock market patterns, debt levels, interest rate cycles, sentiment levels, and banking reserves are all aligning for a credit crunch and major asset deflation. In the stock market rebound of early 1930, investors were overjoyed that they had survived the 1929 crash. There was a mild worry about recent commodity rises and inflation but the mood was still ebullient. Investors were ‘only’ down 20% off the 1929 highs (much like the S&P500 today). President Hoover told banking officials visiting the White House in June 1930, “Gentlemen, you have come 60 days too late. The depression is over.” But the mood turned down again, inflation began to cool, commodities fell, and investors realizing that the large debt they had accumulated in the last year had to eventually be paid back started selling stocks. The third leg of the bear market resulted in the Dow Jones Industrial Average falling 85% from its high in April 1930. Three banking crises occurred during the next 3 years as frightened people desired cash. Farmers and investors were forced into foreclosure. Finally in 1933, when the debt had been cleaned out of the system, the stock market hit bottom and rallied for the next 73 years.